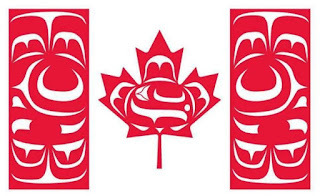 Idle Hands Empty Brain ...: Happy Canada Day !! This wall hanging was done in 2008 for a guild challenge and has served me well since then. It only comes out for the Canada Day week as I don't want it to fade. I love the Mountie with her horse! I have finally arrived in the sewing room and along with digging up lots of "I'm going to use that someday" stuff (now to go to the Goodwill - with lots more to find yet!) I have started sewing again. YEAH ! But have I re-started my Canada 150 Facebook quilt-along ? Noooo, and I'm 93 blocks behind ! YIKES ! No, I did some mending for my niece and my sister and did some sewing for Wellspring, my sewing group's charity. Wellspring is a cancer charity, and they have a craft booth which helps support them. We make all kinds of fabric items and I was once again asked to co-ordinate our group's donations to their booth. So, I made this lunch bag. I used a cupcake version of it when I was still at work and really appreciated it. The lunch bag is roomier than it looks and I'm happy to have finally made use of this terrific cutlery fabric. I have another one cut out and may get to it today. The pattern tutorial is from Pink Penquin and is well written. This pattern would also make a fabulous sewing bag - with different fabrics of course ;). I saw this fabulous fat quarter at the local FL store and just had to make this bib for my grand nephew William. I thought it was more "manly" than the owl bibs I made for his sister which my niece is now using for him ;) Also, it kinda goes along with his theme of Foxes - and other wild life! Purchased 2 FQs so I can make a second one for William. Posted by Idle hands, empty brain ... at 11:16 a.m.
Will it or Won't it ?